Pretty n'Love French Style Basket Bag. Click HERE to obtain this item. Now, I definitely like the idea of the bag and its overall look. It reminds me of certain types of craft paper, lace napkins, or the cute decorative paper cups for cupcakes. 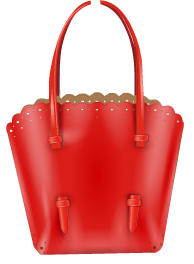 but I'm certainly not satisfied with the shade of red Stardoll chose, and the very odd graphics. Because of that, the very pretty bag has turned into something tremendously cheap-looking and something that you might want to avoid. That is, of course, unless you really like the bag regardless of its flaws, because, let's face it, the bag is kind of pretty. Just no. 24sd is absolutely not worth it. I think I'd feel super guilty for spending 8sd on it, but 24? That really has to be a joke.